Pixar: What creative departments work on a film? How Does a Pixar Film Get Made? 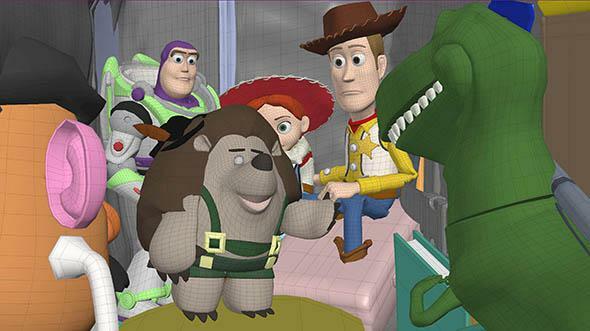 Toy Story characters and sets are created in the computer, via a process known as modeling, by technical directors. This question demands a lot of detail, and I’m not sure I can provide all of it. I’ll do my best to sketch it in here, but I’ll doubtless miss something. I’ll probably also get stuff wrong. There are a lot of moving parts to a Pixar movie production. There are people whose jobs involve keeping track of those parts. I never worked one of those jobs. Keep in mind that every single thing you see on the screen has to be designed, built, placed, animated (where appropriate), shaded, and lit. Nothing comes for free in computer-generated animation. Director: Originates the story and creatively guides the production. Producer: Makes the big machine run and execute the director’s vision. He also keeps the director’s requests in check. He has to worry a lot about money, schedules, and staffing (which are the same thing). Production office staff: They are the producer’s ears, eyes, hands, feet, and prehensile tail. They make sure all the parts of the machine have what they need when they need it, from pencils to screening rooms. Production designer: Responsible for designing the look of the film. Art director: Leads the art department. Art department: Responsible for the myriad bits of art required, from character and model designs to painted textures. Story artists: Along with the head of story, they develop the story beats of the film visually, drawing tens of thousands of story boards, none of which will be seen in the final film. Modeling and articulation: Modelers build the geometry of the sets, props, and characters. Articulation gives models the ability to move and change shape. Editorial: This department spends the entire production, sometimes five or six years, in crunch mode. Animated films at Pixar are edited constantly, starting with the story reels (which are story boards with scratch vocals) and right up to the final release. Often overlooked on the outside, editorial is where movies are made. Everybody else gets them the raw materials. Animators: These are the actors in Pixar films. They take the layout and the (hopefully) final dialogue and animate each shot. The definition of animation used at Pixar is “to bring something to life.” If the audience is convinced that a character’s actions are the result of a thought process, then they will see that character as alive. Animators must also respect what John Lasseter calls “truth to materials,” meaning the physics of motion need to match what the character is made of. This is all much harder than it sounds. Camera artist: A lonely specialty, once mine, where the final camera operation and focus pulling is applied. They work in parallel with animation and editorial to effectively animate two unseen characters: a camera operator and a focus puller. They use the same tools as the animators but animate the camera only. Shading: While animation is in process, these people write (and paint) the shaders, which describe the surface appearance of every single thing in the film. Sim: Short for simulation, this is where clothing, hair, blowing leaves, or most anything else that can be animated algorithmically is developed. There are also people who work with art to tailor the clothing for those characters that need it. The demands on this department vary wildly from production to production, as you might imagine. Effects: The line is kind of blurry for me between here and sim. Effects will definitely cover flame, smoke, clouds, and sparks. The work they do also varies immensely from show to show. Lighters: Once all of the above is done, lighters put the final illumination on shots. They are the other half of the “cinematography brain” and are the ones who make it all look good. Up to this point the shows can look pretty crude. Things get really pretty in lighting once all the shadows, reflections, and proper light sources are introduced. It’s put off until this late in the pipeline because they need all the other input and rendering starts getting expensive here. I’m giving short shrift to rendering, compositing, color grading, output, post-production, localization, marketing, and probably dozens of others. This is really just a sketch of the big production machine. Pixar Animation Studios: Were Pixar animators unhappy to work on Cars 2? Pixar Movies: How involved with Toy Story was Steve Jobs? Pixar Animation Studios: What was it like to be at Pixar when the Disney merger was announced?